The 2005 Convention was a Great Success! Well, the numbers aren’t in yet on this year’s PNKCA Convention, but I think we can all agree that the Convention was a lot of fun and that alone makes it a wonderful success. 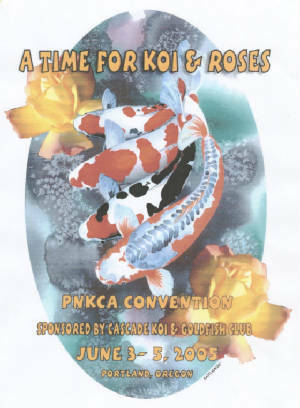 As the incoming PNKCA Chairman I would like to thank the Cascade Koi & Goldfish Club for hosting the convention this year, all your hard work certainly paid off! It is always amazing to me how few people it really takes to put on a great convention and this Portland convention was certainly no exception to that! I believe that Cascade Koi & Goldfish Club managed to put on this wonderful convention with a workforce of less than 15 people. The speakers were fantastic…I could never get tired of listening to Dr. Erik Johnson, Vickie Vaughan-Burnley, or Dr. Tim Miller-Morgan! Dave Dewire was a wealth of knowledge on pruning pines, and what a team Chris Moore and Tim Zuber made. It was really interesting listening to Tim talk about his new pond liner technology and I always learn something new from Chris on pond and koi keeping. Our local koi dealers from Oregon Koi Gardens, Arthur Hixon and Tony Prew were extremely knowledgeable and very entertaining speakers. What great donations for the auction and raffle! Thank you to all the businesses, vendors, individuals and clubs who generously donated to the convention to help make it such a wonderful success. The Awards Banquet was lots of fun and the food was great. We did miss Peter Enfield, our extremely deserving new Bronze Koi Award recipient, who was not able to attend this convention. For those of you who are not aware, Peter’s wonderful wife Silvia, had a stroke just before Christmas, it has been an extremely tough year for both of them and we wish them the best. I was not able to attend the Pond Tour but I heard that the pond tour was extremely nice, that the ponds were beautiful and everyone had a really great time. As much fun as these Conventions are, I am always amazed that we don’t have more people attending. Thanks again to Cascade Club for hosting one of the best PNKCA Conventions yet! We have been avidly searching for a club to host the 2006 PNKCA Convention and the Mid-Columbia Koi Club has graciously stepped up to host next years PNKCA Convention. One of the first and best PNKCA Conventions that I have attended was one that Mid-Columbia hosted in 1996 at a beautiful winery with a natural pond that was home to koi and several other species of fish. It was a wonderful convention and I am sure that they will do an exceptional job again with next year’s convention. For those of you who are unfamiliar with where the Mid-Columbia Koi Club is located, it is in the Tri-Cities area (Pasco, Kennewick, and Richland, WA). I know that they have already had a planning meeting and are extremely excited about hosting the convention. They will let all of us know as soon as they have some details worked out. I know that I am really looking forward to visiting the Tri-Cities area…we visited some really great antique shops when we were there in 1996! Planning is already also underway for the 2007 PNKCA Convention hosted by Canada Koi Club of British Columbia. Dai Ichi Koi and Japanese Garden Club has offered to help Canada Club with organizing the convention and pond tour, it should be another great convention to look forward to! I felt so fortunate for the last two years to work with such a great Executive Board. Jerry Tyler promised me that above all we would have fun and that we did! There were some tough decisions to make and some interesting situations but Jerry kept his promise, it was always fun and we did have a wonderful two years together! Now I am really looking forward to working with another great group of people for the next two years and I know how fortunate we are to have them on this Executive Board. Gene Anderson has accepted the position of Vice-Chairman. Even though Gene is new to this position, he certainly is no stranger on the Executive Board! He has generously donated his time and energy for many years as the Newsletter Editor for PNKCA and written many articles for the Web Site. Most of you know Gene, he is the man behind the camera at the PNKCA Conventions, pond tours, and most of the Koi Shows in the Pacific Northwest. Anne Potter, from Washington Koi and Watergarden Society, has accepted the position of Secretary. 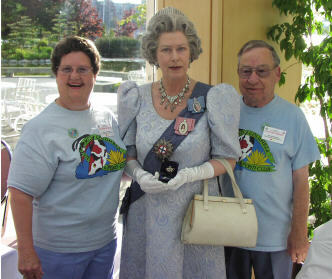 She has been a PNKCA Representative and a Secretary for the Washington Koi and Watergarden Society for many years. I have had the pleasure of visiting with Anne at the Washington Koi Show each year and I am really looking forward to working closely with her on the PNKCA Executive Board. I know it will be hard to follow in the footsteps of Phyllis Anderson, she has done such an exceptional job as our past Secretary, but Anne Potter is definitely up for the challenge and will do a fantastic job. Raeleen DeGrandpre has accepted the position of Treasurer for another term and we are extremely fortunate to have her on the Board. You would have had to be blind not to have noticed Raeleen at the Convention this year! She was juggling so many different jobs…collecting the Super Raffle tickets and monies, selling general raffle tickets, selling PNKCA T-Shirts and Totes, collecting money at the auction...where does she get all that energy? Thanks so much Raeleen for all the hard work and keeping our finances so well organized! And last, but certainly not least, I would like to say how lucky we are to have Phyllis Anderson as our PNKCA Web Master. She took this position over for us this year after the Web Site crashed. She has worked long hours and saved PNKCA lots of money by donating her very valuable time and energy on rebuilding the PNKCA Web Site. With all of her hard work Phyllis will save the PNKCA thousands of dollars in Web Site costs, we are so fortunate to have her in our association, thank you Phyllis! All of the Executive Board members are really looking forward to a very productive and fun year. Please let us know if you have any ideas, suggestions or concerns that you would like us to discuss at the next Spring Representatives Meeting. This is your association and we look forward to hearing from you. Hope everyone has a wonderful summer enjoying their koi and all of the great koi shows!